Summer’s warm temperatures encourage fast decomposition of the plants, mulches, chicken poop and kitchen waste that go into my two big compost piles, so my biggest compost crop of the year is ready in the autumn. I use some of my just-done compost to plant garlic, and heap more onto beds that worked especially hard this past season. But storing compost through winter is a wise move, too. When seed-starting season revs up in late winter, it is hugely convenient to have cured, crumbly compost ready and waiting, rather than locked up tight in a frozen heap. In the short run, harvesting and storing compost frees up composting space so you can collect more leaves or start a new heap. Material from the topmost section of a compost pile – which is far from decomposed – can be set aside and mixed back into the new heap. The compost is likely to be somewhat compacted, being from the bottom of a heavy heap, but the process of moving it into storage containers will admit a welcome supply of fresh air. Leave the compost clumpy, especially if it is quite damp. Freezing and thawing during the winter will naturally break up many of the chunks. Storing compost so that it is protected from rain and snow improves the overall quality of the compost, because it allows time for the microbial communities to shift and change a few more times - call it the tail end of compost curing. Soil needs stillness for colonies of fungi and bacteria to flourish; the extra curing time spent in stable storage containers enhances the habitat for microbes that transform almost-finished compost into loose, spongy humus. Many gardeners use a simple garbage can peppered with air holes to store extra compost. Small cans weigh less when full, making them easy to handle, and painting a can black raises the temperature of the stored compost by increasing solar gain on sunny days. If you can secure the top to a compost garbage can with a couple of bungee cords, it can be rolled on its side to aerate the compost inside. 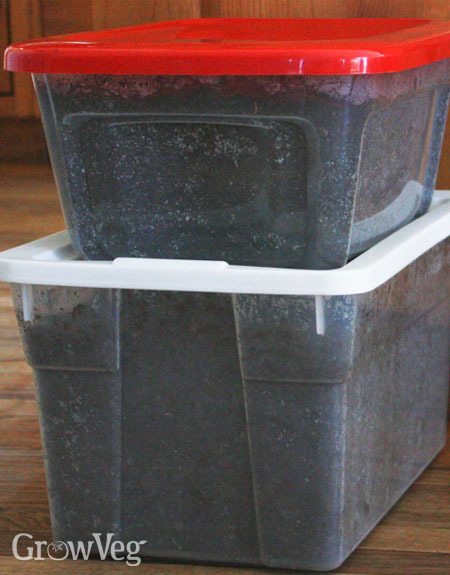 Plastic containers expand when the compost freezes, so they are well suited to storing compost. By late fall I have amassed a messy mountain of empty plastic pots and buckets, which have become my favourite containers for storing compost. I simply fill them up with compost and stack them in a dry place sheltered from rain, and forget about them until I need some compost. I also like to partially fill a couple of plastic storage bins with my best compost, which is destined for use in potting soil. These I keep in the basement where it’s cool but not freezing. You can also re-use sturdy bags of various types, though it is important that some fresh air gets inside to keep microbes happy. Poke holes in plastic bags, or leave them open at the top. Fabric shopping bags make great containers for storing compost, too, but because the bottoms stay so moist, they must be stored on a non-wood surface that won’t rot. One of the best composters I’ve ever known stored his finished compost in loosely covered plastic pails in the crawl space under his house. He firmly believed that aging the compost for six months was essential for making it as good as it can be. I think he was right, and research has shown that the microbes in compost continue to change long after the organic matter has stabilized. Time to store up some compost! "How do you deal with the bugs you'll bring into your house?!! I do vermicomposting and save compost from that for starting transplants in the spring. I have used leaves in the worm bin and have introduced outside bugs into the house so now I just use shredded paper, cardboard and household vegetables which have been frozen first to kill the fruit flies and fungus gnats. Great article and good ideas." "These are one of the best Composters i have ever seen and a great way of composting.Thanks for sharing your ideas." "I have a lot of kitchen scraps/ bananas, egg shells etc/ - should I keep such frozen outside till early spring and mix it with leaves etc? Thanks for advise"